On Saturday 16 March we will be celebrating our first year in Leeds, and we'd love you to join us! We've got a new film to show you all about the work we do here, and a fascinating new exhibition of recent donations from the public. You can also try a taster of our Schools Programme as we'll be running Proof of the Pudding workshops throughout the day. Find out more about our famous Melt in the Middle Chocolate Pudding, puzzle over the problem of creating a liquid centre - and then try one for yourself! At Kirkgate Market, our newly opened M&S Heritage Stall will be the starting point for our brand new Heritage Trail. 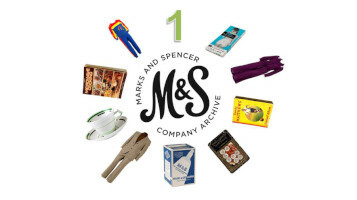 Our Guides will be on hand at 11am and 1pm to lead tours along the route, which takes in some of the well-known, and lesser-known sites connected with M&S in Leeds. Plus there'll be a cuppa and piece of cake waiting for you at the Archive!